Packed in a convenient 300ml trigger spray. 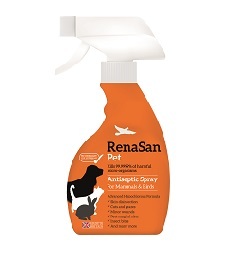 RenaSan is perfect for flushing wounds and preventing infection. Safe to use on all mammals, birds and reptiles. 100% natural, pH neutral, non-irritating and non-sting. Safe if licked.